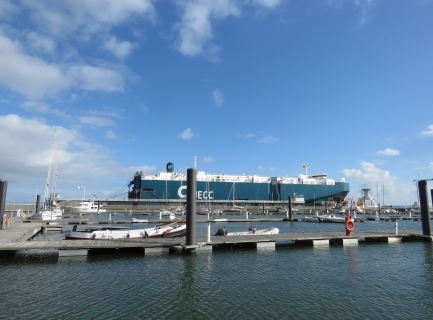 Cuxhaven, Germany sits at the mouth of Elbe River and the North Sea. 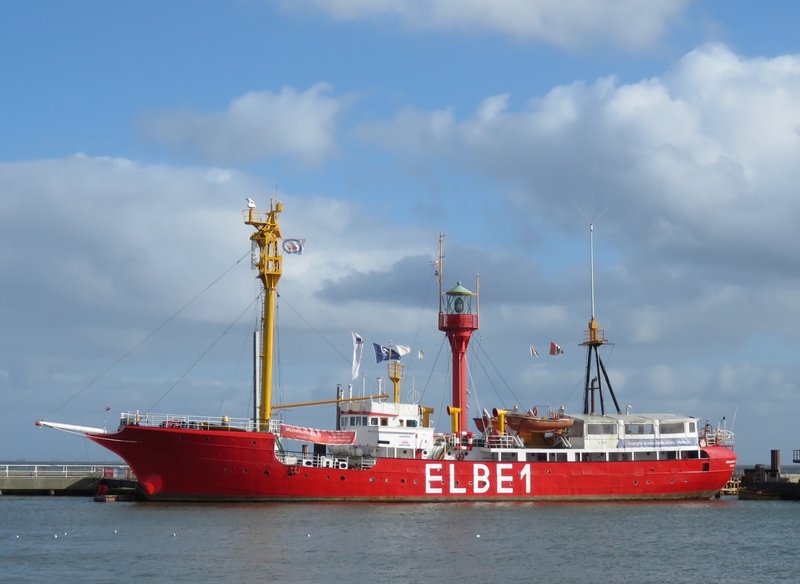 For centuries the location was a stronghold to control sea access from the river and continues that tradition as an Elbe River pilot station. While the river provides much positive value to the city, it also has negatives. 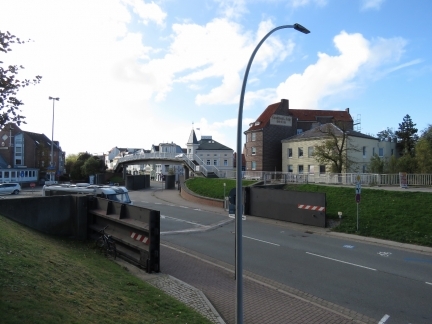 Dangerous seas form when storm winds blow against a strong ebbing current, and much of Cuxhaven is built behind dikes for protection against frequent high flood waters. The river also carries so much sand that the marina we stayed in for a week requires annual dredging. 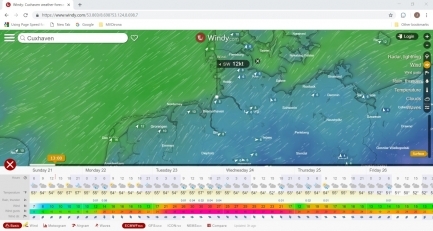 The weather is not looking great over the the next few days for an offshore run through the German Bight to The Netherlands, but hopefully conditions will settle down by the weekend. While correcting the oil leak at the oil-drain fitting yesterday, James noticed two aftercooler bolts had backed out. He tightened them all, but only those two were loose. To address our davit extension problem, we dug out the spare davit manifold (at upper left near the open locker door) from our spares from the bottom the locker between the master stateroom and the galley. The locker door is deceptively small, but the locker holds an enormous amount. 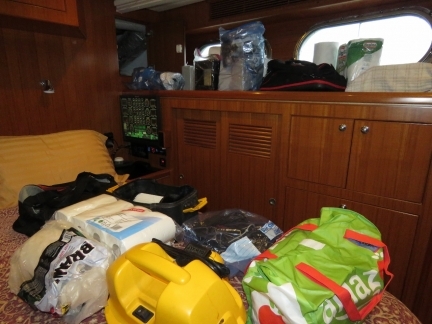 Everything on the bed and shelf came from there. The spare davit hydraulic manifold, partly uncovered to access the extension/retraction valve and solenoid. Hopefully replacing those parts will fix our davit extension problem. 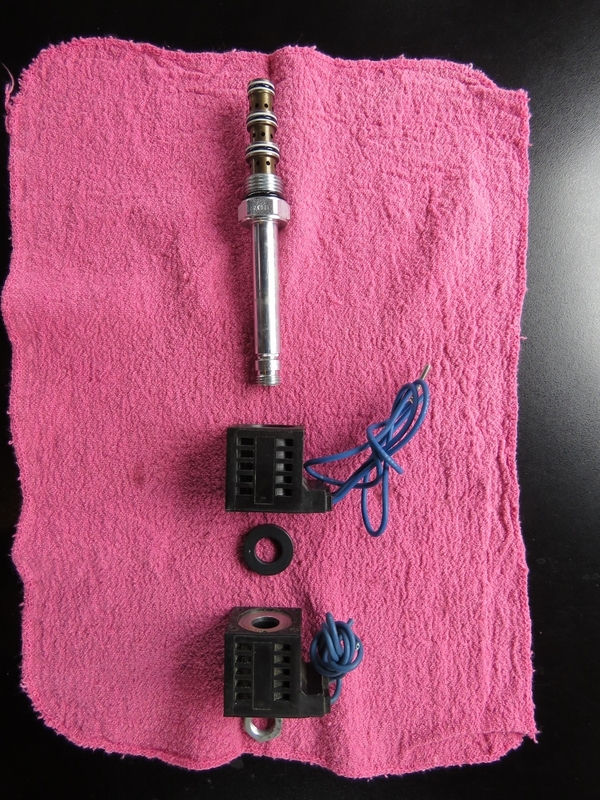 The old davit extension/retraction valve and solenoid after swapping in the new parts from the spare manifold. Changing the extension/retraction valve and solenoid didn’t fix the davit problem. The problem turned out to be an intermittent pendant issue, where every time we tested a part before changing it the davit would work. When we changed the part, the davit would work continuously for a few minutes, then return to being intermittent. 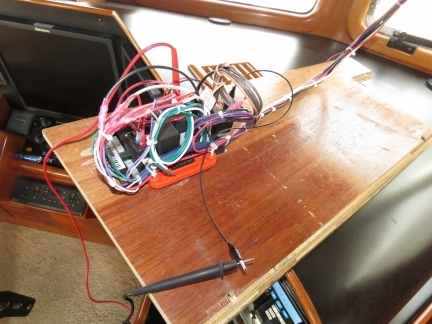 This is our original pendant that had a proportional trigger failure years ago. 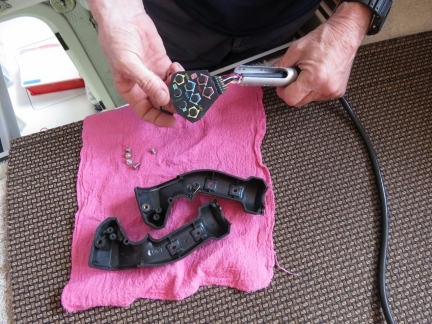 After it failed years back, we went to the spare that lasted a year before it too had a proportional trigger failure. We then bought a third pendant that has never been used, disabled the proportional functionality on the crane, and returned to using the first pendant now without the trigger. Today we returned to the backup pendant that had been in use for a year but it didn’t work at all. Our third, never-used backup pendant did work, so we’re back to operational again. 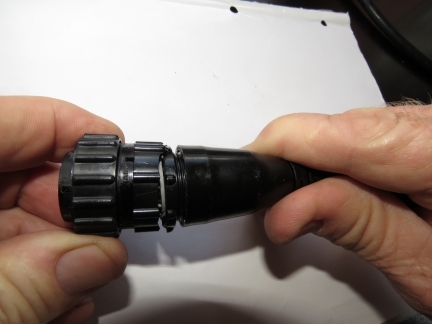 The third pendant worked, but as hard as this was for us to believe, it appears to have an over-torqued connector at the plug end and the plastic collar has split exposing the wires. It’s probably been like this since we bought it and we just didn’t notice or it could have happened in storage as a consequence of the plastic aging over time and the connector being installed overly tight. 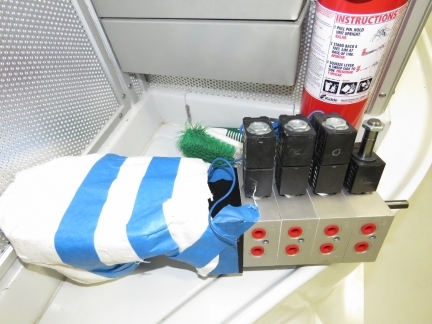 With the failure of three expensive pendants over eight years, we’re going to try a Kar-Tech remote control instead. 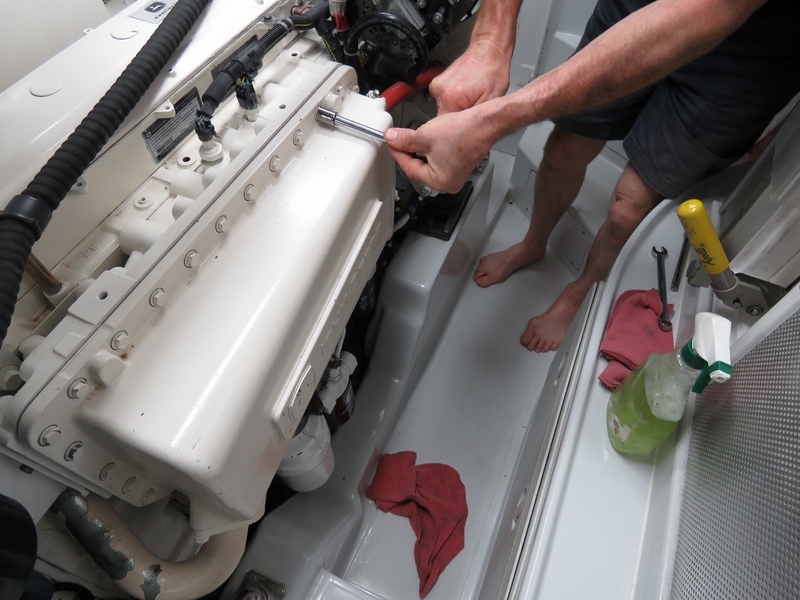 James installed a new relay onto the Dynagen TG410 for the main engine autostart system and added software to alert us when autostart is disabled on the main engine. We always should have it on except during engine service. This change prevents a trivial human error from leading to battery flattening. Looking across the YC marina from shore. The marina is nearly empty now because it closes on October 31st. 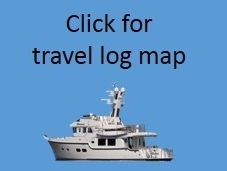 As along the northeast coast of the US, all the docks will be removed to avoid winter storm damage. 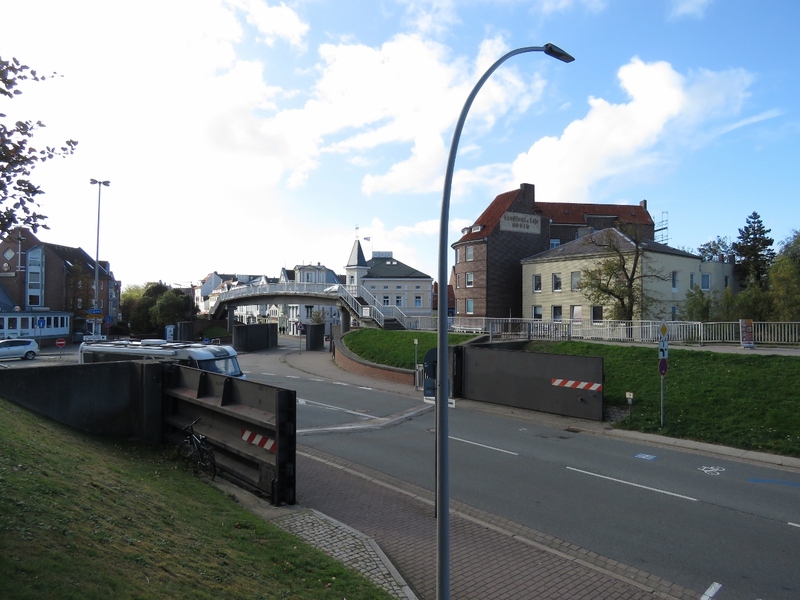 And before they are re-installed in the spring, the marina basin is dredged to remove sand build-up from the Elbe River. Paying for our moorage at the automatic machine. Germany is quite a change from Norway where almost all transactions are done using credit cards. The parts of Germany we’ve seen so far seems to be mostly a cash economy. The only places we’ve been able to use a credit card here are at grocery stores or automatic machines. No restaurants we’ve been to so far in Germany accept credits and, watching other patrons, it appears everyone pays with cash. The Hamburg Lighthouse, completed in 1804 and named after the city to which the area once belonged, operated until 2001. German physicist and electrical engineer Ferdinand Braun, who won the 1909 Nobel prize for physics jointly with Guglielmo Marconi, used the tower in 1899 to conduct wireless telegraphy experiments. The 167ft (51m) Elbe 1, the largest German lightship, was in service from 1948 to 1988. Positioned offshore at the mouth of the Elbe River, the ship often was rolled to 40° in steep waves generated from storm winds blowing against the river current. 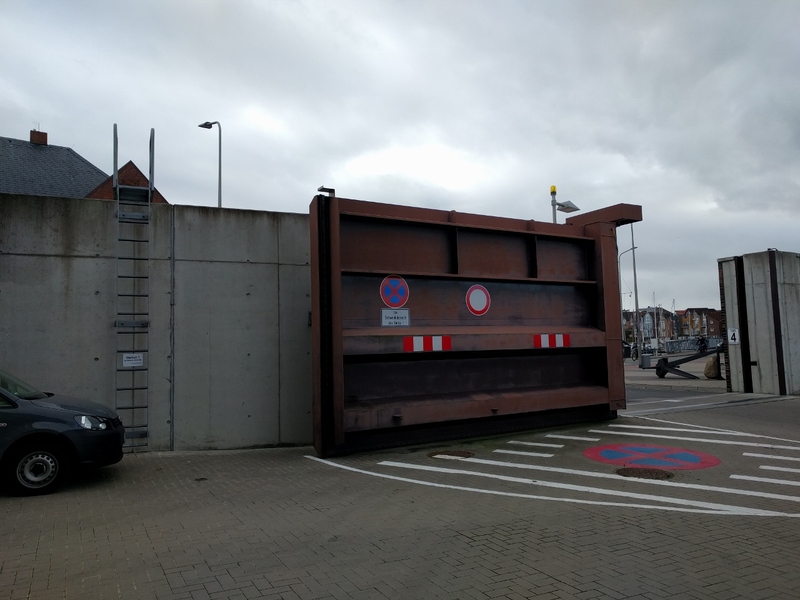 The Elbe River is susceptible to floods and Cuxhaven is protected behind dikes with large floodgate doors that can be closed when floodwaters approach. We had a great lunch at nautical-themed Austernperle overlooking the inner harbour. 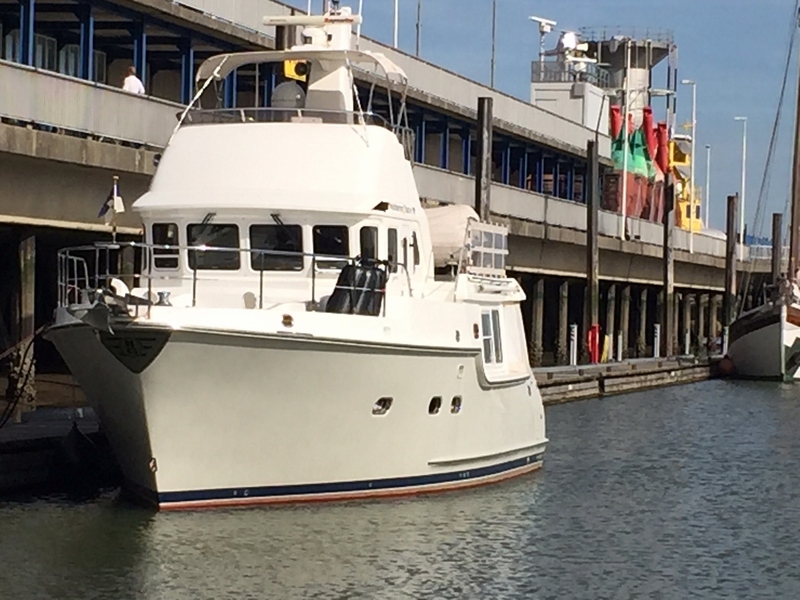 Seen on a fishboat in Cuxhaven Harbour. 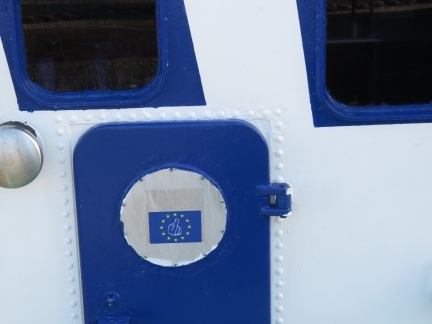 Apparently not everyone is an EU supporter. 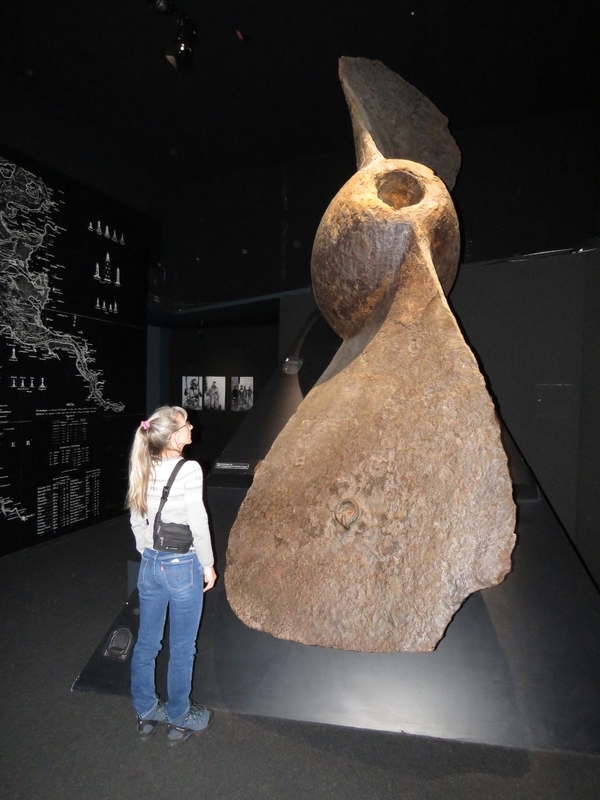 Propeller from the German steamship Cimbria at The Windstarke 10 (Gale Force 10) museum in Cuxhaven. An estimated 400 passengers drowned when the ship collided with the British steamship Sultan in the North Sea on January 19th, 1883. The museum details the shipwreck and fishing history of the region and has some good displays, but all in German without English translations. 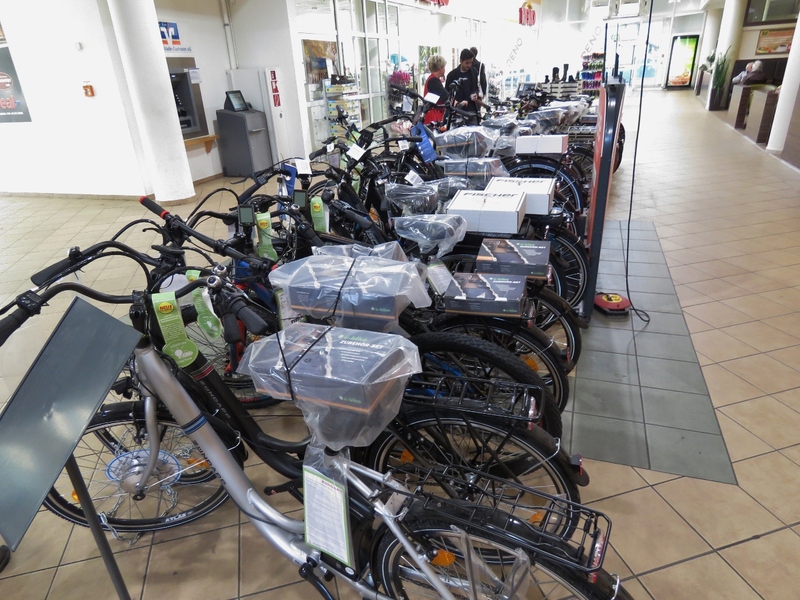 E-bikes are becoming amazingly popular in the last few years—we see them everywhere. We’ve debated whether to move to e-bikes. We love our Giant FCR 2s, because they are incredibly corrosion-reistent, very light and easy to move around the boat, can be transported by tender and passed up on high docks, and we get good exercise from them. But the speed and hill-climbing ability of e-bikes does have an appeal. Their downside for us is they’re extroardinarily heavy and we often find ourselves moving bikes around by tender and passing them up and down difficult places and sometimes even carrying them over short sections of rough terrain. 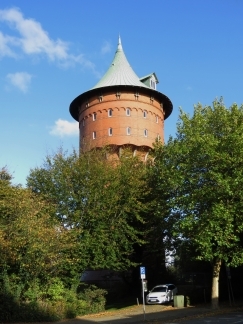 The Cuxhaven water tower, completed in 1897. The tower was built following an 1892 cholera outbreak in Hamburg that killed 8,600 people. 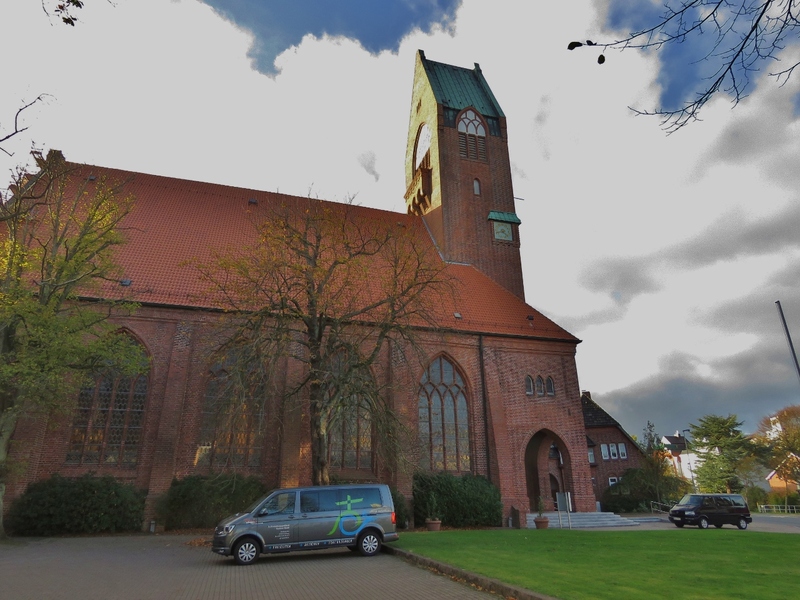 St. Peter’s Church in Cuxhaven was completed in 1911 as a naval garrison church and became a parish church after World War II. 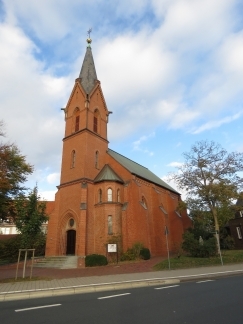 The Heart of Jesus Catholic church in Cuxhaven, consecrated in 1900. 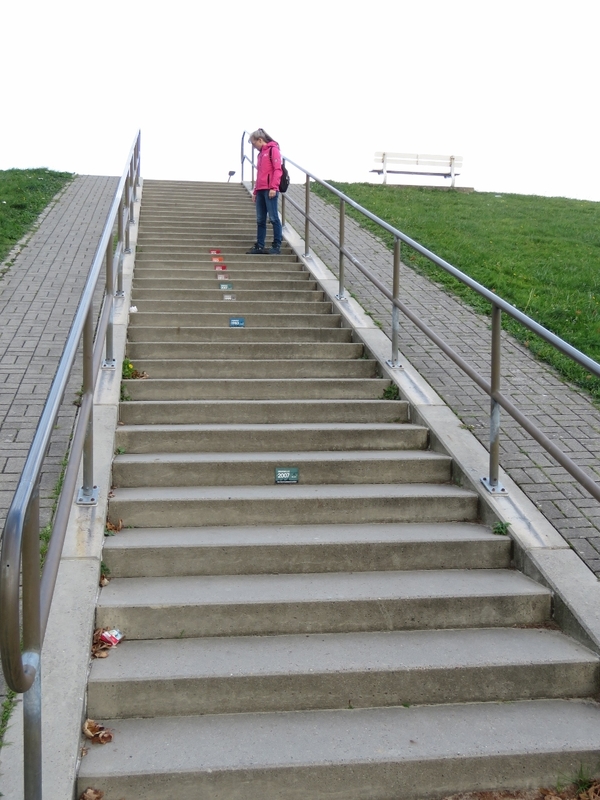 Placards on the stairs over the dike show the highest stormflut (storm flood) levels in the past 42 years. The top and third from the top are both from January of 1976 during a particularly bad year for storms and flooding in Europe. The Jan 2-5 Capella Storm brought 116 kn (215 km/h) winds and killed nearly 100 people, with estimated flood damage losses of US$ 1.3 billion. 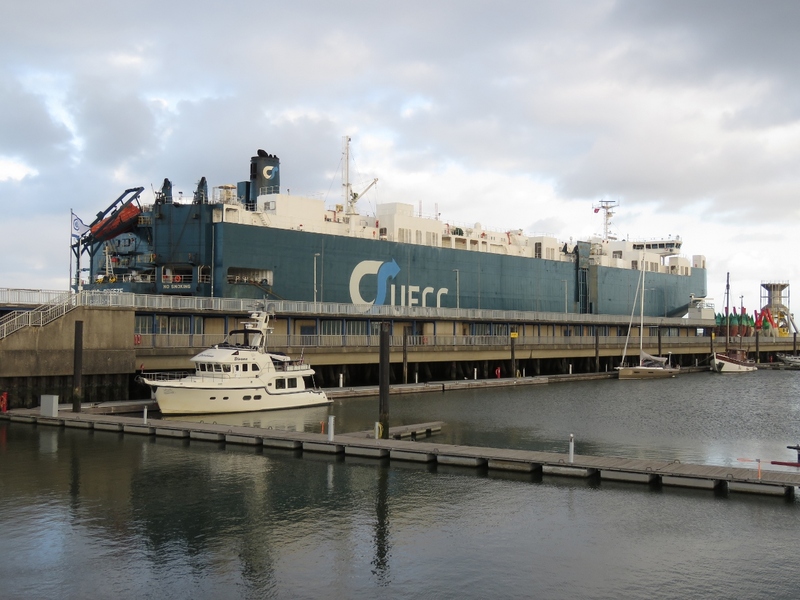 The view to our moorage beside the vehicle carrier Baltic Breeze. We were surprised the ship was in port for so long and later learned it had an engine room fire on October 14th while en route to Cuxhaven and will be in port for several weeks for repairs. 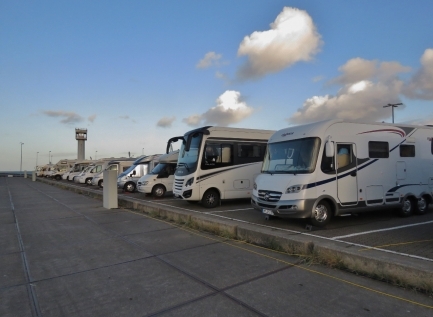 The large RV park adjacent to the marina is quite busy this late in the season. 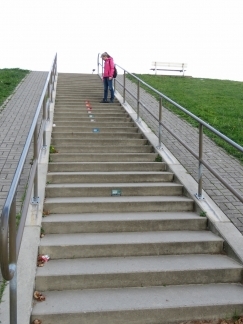 It must be really packed in the summer. 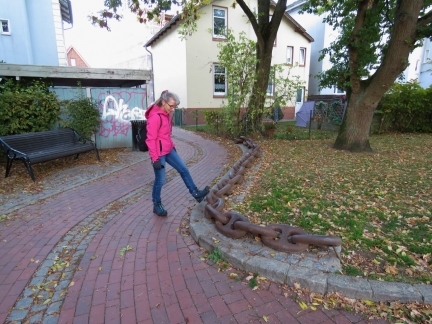 We liked the large chain that edges the lovely brick path from the waterfront to the historic Lotsenviertel district. The historic Lotsenviertel (“pilotage district”) in Cuxhaven was originally the residence for the ship’s pilots, who weren’t allowed to live more than a 1km away from the pilotage post near the Hamburg Lighthouse. 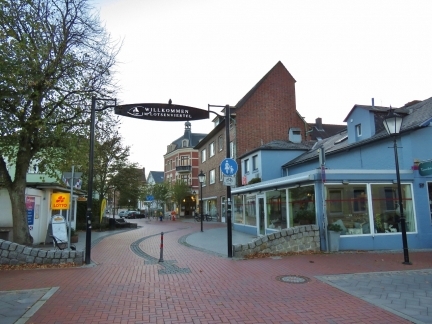 It’s now a trendy shopping and residential area. 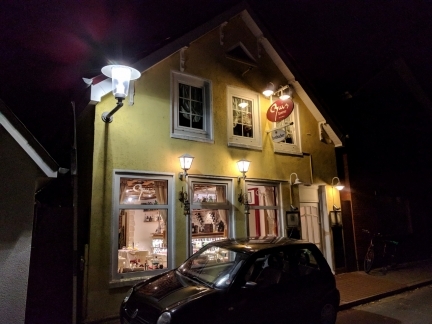 An exceptional dinner at Ruis Taverne in the Lotsenviertel. We had perfectly cooked steaks that included a Portuguese white port welcome aperitif, about 16 Portuguese tapas dishes as appetizers and a small dessert. This restaurant does an unusually good job with real attention to detail—we had a fabulous evening. 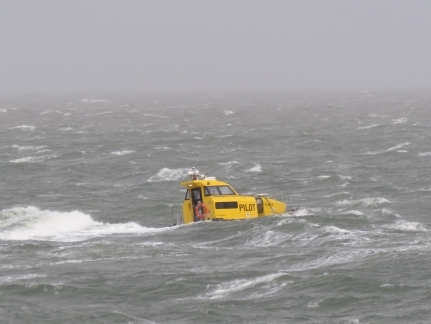 The forecast storm has arrived, bringing winds to 38 knots. A pilot boat working through rough seas in the Elbe River with the storm winds blowing against the ebbing tide. 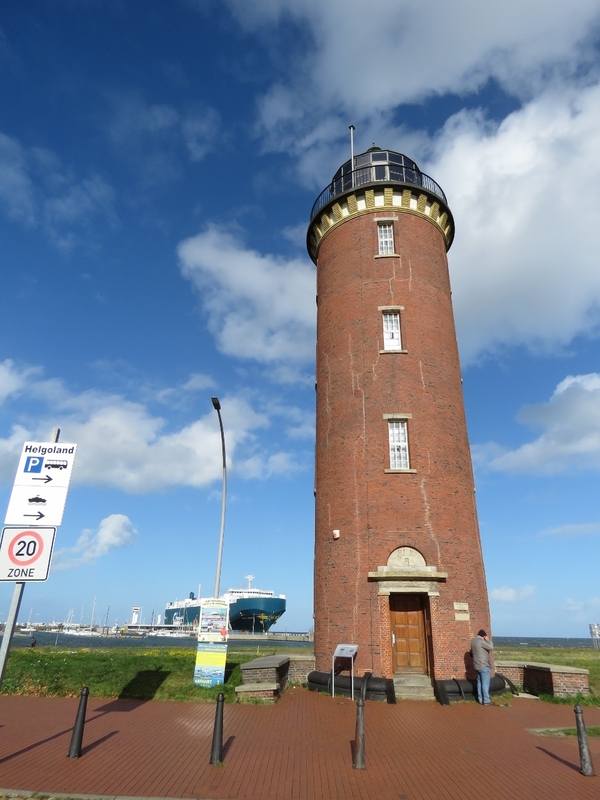 We walked up to the viewing platform above the marina to have a look at sea conditions. 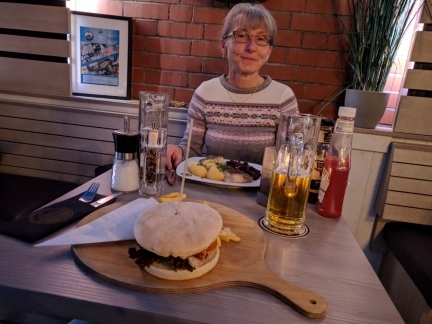 A great meal at Stormflut (“storm flood”) restaurant along the waterfront. 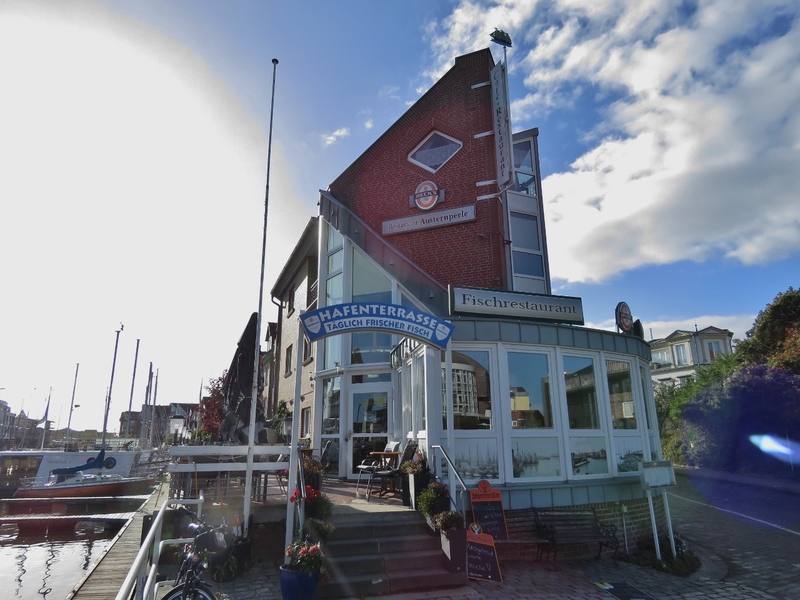 The restaurant is not far above the water level outside the dike, so presumably must flood when the waters rise. The winds have abated a bit, but are still pretty strong this morning with gusts into the high 20 kts. 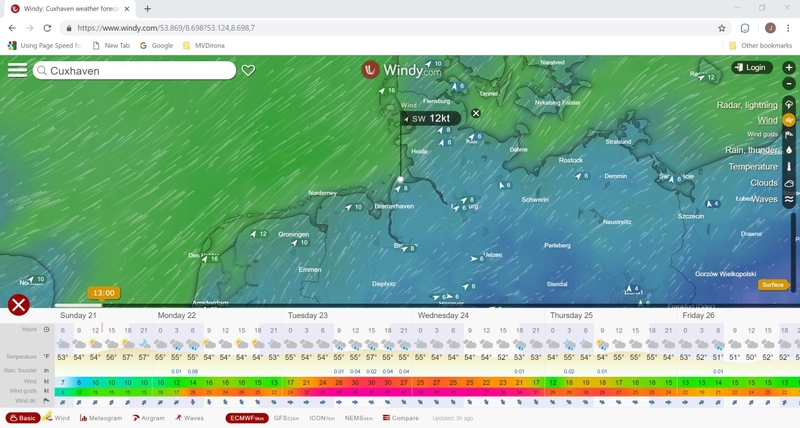 It’s looking like we’ll get a window to run to the Netherlands on Saturday morning. Blog reader Kay Rupp came by for a visit and a tour of Dirona with his friend Alfred Wilhelm. 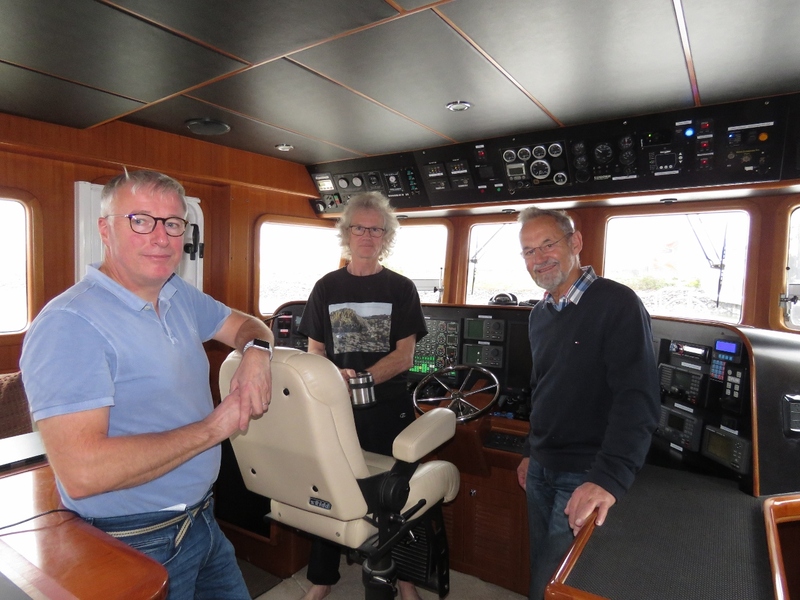 They live near Rendsburg and missed us as we passed through the Kiel, so took a ferry over to see us in Cuxhaven. 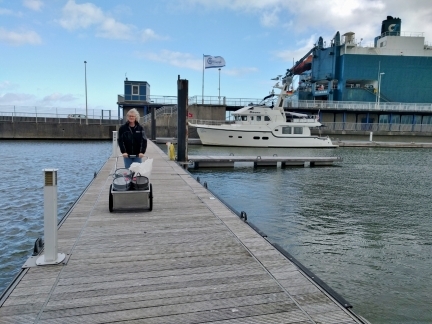 Both are long-time boaters in the area and had good advice for local conditions and places to visit. A friendly visit from the local Water Police. They wanted to see our ship’s papers, operator license, and radio license and asked a few questions about safety equipment such as lifejackets. 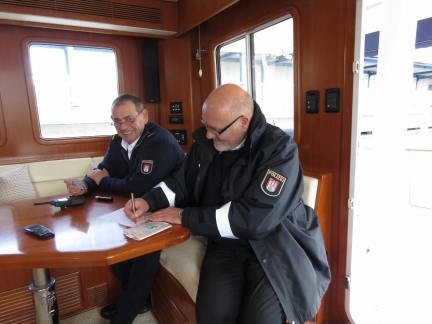 The US doesn’t offer a national license for pleasure craft operators as do most European countries, but they were fine with our Washington State Boater Education cards. 15 gallons (56L) of used oil loaded into our folding cart for disposal. 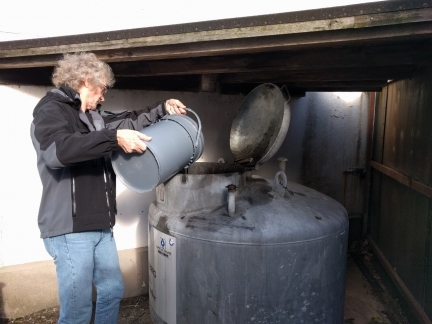 We possibly could have gotten rid of our used oil in Amsterdam, but it was only a 10-minute walk to the oil disposal at the Cuxhaven harbour and was unlikely to be easier in downtown Amsterdam. Large flood control gates at the Cuxhaven harbour. 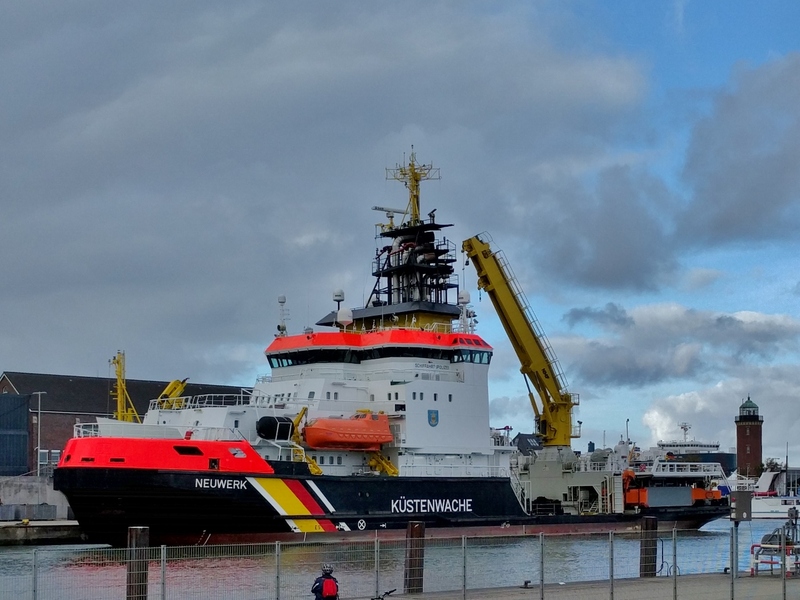 The 260ft (79m) German Coast Guard vessel Neuwerk in port at Cuxhaven. The marine pollution control vessel is also used for buoy tender operations, shipping police support tasks, icebreaking, firefighting and emergency towing operations. 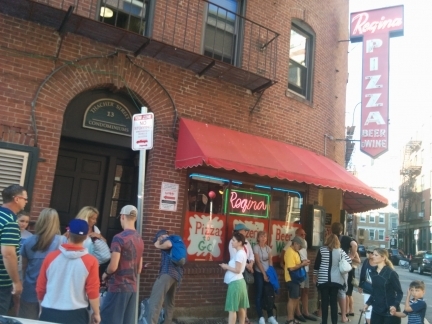 When we were in Boston in the summer of 2016, native Ronald Hellmann recommended we try Regina Pizzeria. Founded in 1926, it’s the oldest pizza house in New England and is incredibly popular. We arrived silly early at 5:25pm and still had to wait 20 minutes for a table. Ronald just wrote to us to say Regina Pizzeria had been rated the νm;1 pizzeria in the US. They deserve it—we’ve had pizza all over the world and that definitely was one of the best. Gerhard Jensen, owner of N43 Wandering Star, sent us a photo of his boat in June of last year moored at just about exactly the same location we are in Cuxhaven. The boats look so similar we thought it was a photo of Dirona at first glance.